Creative Director and Designer Olivia D’Orazi creates mesmerizing, psychedelic photographs and projections inspired by the natural beauty that exists all around her in her home state of California. D’Orazi studied fashion merchandising and marketing before studying creative direction in London, where she first debuted her talents in video in the form of what the artist refers to as “liquid light shows.” Her hypnotizing work is a kaleidoscope of color, revealing a depth of beauty in her native flora as well as the American southwest landscape. Join us as we discuss with D’Orazi the aesthetic influence of the 1960s/70s in her work, her experience in the music scene in London, and the artistic motivation that comes from traveling. Where does your creative talents come from? Have you always considered yourself an artist? I never considered myself an artist growing up but always thought of myself as a creative person. I had an interest in photography and film from a very young age. I wasn’t the best at traditional art forms such as drawing and painting, which when I was young is what I thought meant you were an artist. It makes me laugh now when I think about it. It wasn’t until I attended the University of the Arts London I discovered my artistic talents and really started to pursue a career as one. You’ve grown up in California, surrounded by its naturally beautiful landscape. Has this influenced your aesthetic eye? It has a huge influence on my aesthetic eye and work! I grew up in a small forest town in Northern California in the Sierra Nevada foothills called Paradise. There was never much to do in Paradise, but it is very beautiful and I really appreciate going back there now. I think the fact that it was so secluded forced me to be more creative and seek out adventure. When I was seventeen, I moved to Long Beach to study Fashion Merchandising & Marketing at California State University, Long Beach. Living in Long Beach allowed me to explore Southern California, and now at 27 I am based in the cute area of Echo Park in Los Angeles. The landscapes of Northern and Southern California could not be more different, but I find inspiration in both of them; from photographing the stunning forests & coasts of Big Sur (my favorite spot!) to the cacti & palm trees in the deserts of LA. Let’s talk about your creative process. How do you achieve such mesmerizing, saturated colors in your work? A lot of my creative process is a secret! I took a long time developing my own tools and skills while I was studying in London, which are still constantly changing and evolving as I grow as an artist. I shoot all of my photos and films on my iPhone. My whole life I've been big on color and patterns, which clearly has translated in to my work. I want to make the world a more colorful place! My art is how I show my view of the world. Do you use analogue film or digital tools, or perhaps both, in your photography? I use a bit of both. Not really analogue film, but certain techniques I use to create are not digital. I tend to merge the two. You not only work in photography, but in video as well, creating projections and music videos. 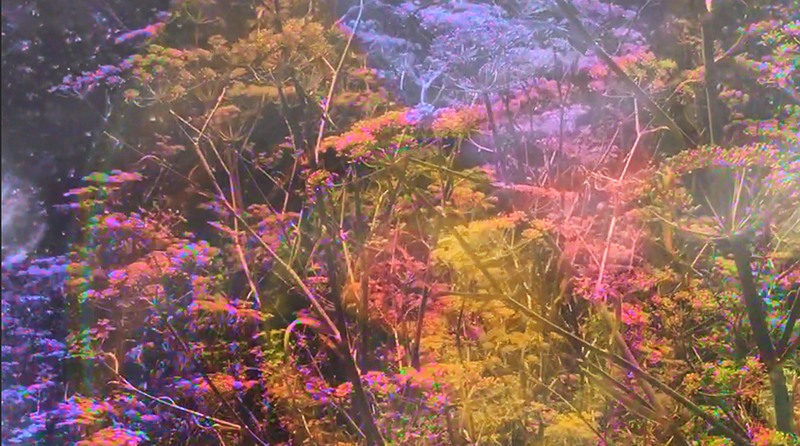 Can you tell us about your psychedelic films and video projects? Yes! I love working in video! My dreamy psychedelic aesthetic actually started because of the first video I made. While I was studying in London, I was given the assignment to create a film. It could be of anything. We had to select an image for inspiration and go from there. I am heavily influenced by my love of the countercultures of the 1960’s and 1970’s, which I get from my creative, musical, hippie parents who grew up in these eras in the San Francisco Bay Area. I had wanted to create my own liquid light show like those from the 1960’s. So, I selected an image of Jefferson Airplane performing with a liquid light show for my inspiration and went from there! In 2013, I created my first liquid light show using traditional techniques from the 60's mixed with my own modern twist. From there, my psychedelic, trippy, dreamlike style was born! As a result of this assignment, I started creating and working on more videos in this aesthetic. At one point I was creating up to 10 films a week! The 2nd psychedelic film I made was for fun to a Night Beats song and they ended up using it as a music video. After I created this film, I purchased my first projector and started creating projections and live visuals for events and bands including Night Beats. The music scene in London was incredibly vibrant at the time and I was fully immersed in it. I was constantly making great connections with musicians, bands and event producers. Lucky for me they liked what I was doing, which led to some great opportunities. Just six months after creating my first Liquid Light Show, I was selected to exhibit my psychedelic films at the world renowned Royal Academy of Art in collaboration with a Dennis Hopper exhibit! It was one of the most surreal and exciting moments of my life, I was only 24 at the time. I also was able to start touring as a live visual artist through my new connections! My first tour was in England and Italy. Touring is one of my favorite things to do as it combines my loves of art, music and travel. It’s a very inspiring adventure! Last year, I worked with the amazing women of Stonefield, a rock band composed of four groovy sisters from Melbourne, Australia. I created a music video for them and then did live visuals for them when they toured LA earlier this year. You’ve previously lived in London, studying at the University of the Arts. Tell us about this experience. Did your time here alter the development of your work? Before I attended University of the Arts I did not consider myself an artist. Before I had even finished my BA in Fashion Merchandising I knew I wanted to move to London, as it was my dream city. I applied to UAL and was accepted into their Creative Direction Honours BA program. I moved to London in 2012, three months after graduating from Long Beach. From there, my creativity and art took off! It was like being on a constant vacation with never-ending inspiration right at my fingertips! The people, music, art, style, and culture was and is indescribably cool and exciting. It was my perfect dream world for that period of my life. I was rarely in university, which allowed me the time to completely immerse myself in the city and explore every corner of it as well as travel the rest of the UK and Europe. My friends who were born and raised in London still to this day joke about how I've seen more of London then they ever have or will! My art developed because of London and I'm forever grateful for my time there. How has your travels changed your personal perspective or the way you approach your artwork? Traveling is what keeps me sane and fuels my creativity! I can get bored with places pretty easily, as I constantly need new sights and sounds to inspire me and my creations. Like most creatives, inspiration comes and goes, and if I'm seeking it I know I will find it in travel. There really is nothing like traveling and exploring new places. It is so important to see how others live and take yourself out of your comfort zone. From my travels, I’ve learned about myself, developed my art, and met some of my best friends in the whole entire world! Besides producing work in photography and video art, do you work in any other creative avenues? My mom and I have an eco-friendly fashion and home décor line together featuring my art as the prints. My mother is an incredibly talented designer and seamstress. We teamed up to create our own line that fuses our design talents together. We started this venture back in 2013 with tote bags while I was still studying in London. When I moved back to California in 2015, we expanded and began designing our womenswear line and our home décor of pillows and canvas wall hangings. It’s super fun to work together! My mom creates all of our sewing patterns and beautifully sews every piece. It's awesome because this collaboration allows me to utilize both of my degrees and creatively work with my mom who is my best friend! What music do you find particularly inspiring to listen to when creating your art? It depends on my mood, what I'm working on and the weather (definitely inspired by gloomy, rainy weather)! But I am always listening to music when I create. Usually it ranges from It 60’s rock n roll to 70’s folk (Crosby, Stills, Nash & Young, my absolute faves!) to modern bands like Animal Collective, DIIV, and Phoenix to name a few.